It is my pleasure this month to introduce to you a few of the people who Make Things Happen in the IHS. Ever been to an international symposium? Then you have reaped the benefits of the tireless enthusiasm and expertise of our interviewee of the month, Nancy Joy. Ever availed yourself of the IHS Online Music Sales? You have Daren Robbins to thank for curating this valuable resource, all the way from Thailand. We also hear from three IHS area representatives from around the world: Chee Ghee Sim in Malaysia, Angelo Bonaccorso in Italy, and Amy Thakurdas in the United Kingdom. 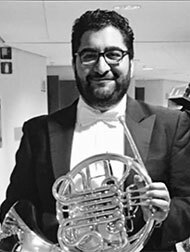 Another of our country representatives, Keith Eitzen (Mexico), is coordinating the Spanish translation of some of the best Horn Call articles over the last few decades. We are excited about these expanded benefits for our members in the growing Latin American horn community, as well as in other Spanish-speaking countries around the globe. Read his account and find out how to access these features. By the way, this newsletter would not be in your hands (nor www.hornsociety.org running smoothly) without our webmaster, Dan Phillips. He shares with us what’s involved in keeping the IHS cyber-worthy. 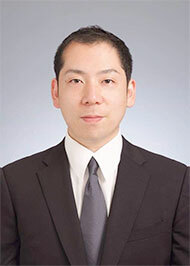 You’ll also learn about a fascinating scientific research project by Japanese professor and amateur horn enthusiast, Takeshi Hirano, searching for the secret to a beautiful sound. In our regular Pedagogy column, we feature Prof. Tina Su and her insights on playing to your strengths. You’ve also got the chance to win a copy of Richard Watkins’ latest CD in our new Trivia Contest! If you are reading this and haven’t yet become a member of the International Horn Society, there’s no time like the present! You’ll find the link below. The IHS has been a source of inspiration, education, and friendship to me for several years. Join and be inspired too! Kristina Mascher-Turner: Dear Nancy, let’s start right off with the color purple! How did your love affair with this hue start, and what does it symbolize for you? A long, long time ago, in a galaxy far, far away when I was a little child, I was absolutely mesmerized by the color purple. This enchantment led me to wanting to surround myself completely with the color, much to my parents‘ surprise. They thought it was odd that their little girl was so adamant about the color purple and told me I needed to wear other colors. As you would guess, that thought process only “fueled my fire.” The color purple makes me smile and makes me very happy!! KMT: How and when did you first become involved with the IHS? NJ: My first IHS symposium was in 1980 at The Jacobs School of Music at Indiana University. It changed my life forever, for the better. The camaraderie, sessions, concerts and playing in the Grand Finale with 500 horn players, was an incredible memory that I will always treasure. The IHS became “a family” to me that year, inspiring me to continue to share the love of horn with many people! KMT: Every international symposium has its own special vibe. What’s unique about IHS 51? NJ: IHS 51 will truly be an inspiring, historically exceptional experience for all of us. From all that I have learned in working with our fabulous IHS 51 host, Jeroen Billiet, we will be even more connected to each other, when we experience the Ghentian Horn traditions. Also, IHS 51 is being held in a beautiful and historical location that will add even more ambience to the week of activities!! As you know, the architecture is absolutely incredible and our hosts, Jeroen & Rik, have planned a week of Featured Artist concerts and activities that will inspire everyone. Let’s Wake that Dragon together and break the Guinness Book of World Records!! KMT: On my way to Brazil for IHS 49, I remember texting you for some contact information. You casually sent a photo from your hotel room there, where water was gushing down from the ceiling! What are some of the strangest things you’ve had to deal with on-site as coordinator? Aunque originalmente fue creada como una organización internacional, la International Horn Society se fundó en los Estados Unidos, y sus primeros eventos y publicaciones tuvieron un enfoque estadounidense. Dieciséis de los primeros veinte simposios del IHS tuvieron lugar en los EE. UU. y doce de sus quince presidentes han sido estadounidenses. Antes del internet y las computadoras personales, el inglés era la opción más viable para la publicación internacional. Esto está por cambiar. La IHS está actualmente trabajando para incrementar su membresía en América Latina, la cual tiene una vibrante cultura musical y un gran número de cornistas talentosos. La música clásica juega un rol igual de importante en la vida cultural latina que en los países europeos. Por ejemplo, al tiempo que orquestas profesionales se pueden encontrar en todas las ciudades principales, el programa de orquestas juveniles, El Sistema de Venezuela, se está copiando en todo el mundo. Sin embargo, la geografía ha limitado la comunicación entre los cornistas hispanohablantes. Para perspectiva, la distancia de la Ciudad de México a Nueva York es la mitad de la de la Ciudad de México a Buenos Aires. Y mientras que el español ocupa el segundo lugar en número de hablantes en el mundo después del chino, en realidad hay pocos materialies disponible acerca del corno y como tocarlo en el idioma español. Como he sido miembero de la IHS desde 1974, tengo una colección casi completa de The Horn Call. Al seleccionar artículos para traducir, varios se me vineron de inmediato a la cabeza porque presentaban ideas importantes de maneras novedosas. Estos los organicé en cuatro categorías: capítulos de libros, entrevistas, columnas y articulos generales. My name is Chee Ghee Sim, and I've just started representing my country, Malaysia. Malaysia consists of 13 states (11 in the Western Peninsula and 2 on the island of Borneo) and is a fairly "young" country as far as horn playing is concerned. We were a British colony until 1957. Music was then limited to the school marching bands, which are still very active today. Most of the school bands use either the Eb Alto Horn or Eb Mellophone for the horn parts, although some of the better-funded schools are slowly changing over to the horn. I studied horn in Munich, Germany with Otto Schmitz and Johannes Ritzkowsky. After 4 years playing with the Staatstheater Cottbus in Germany, I joined the newly-founded Malaysian Philharmonic Orchestra (MPO) from 1998, where I still presently play. 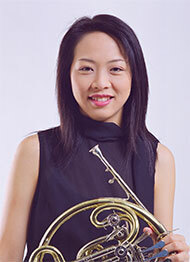 Apart from the MPO, there are 2 other full-time orchestras in the capital city, Kuala Lumpur. The Orkestra Simfoni Kebangsaan (National Symphony Orchestra, 43 musicians with 2 horns) and the DBKL Orchestra (Kuala Lumpur City Council Orchestra, 50 musicians with 4 horn players). There are also a number of community symphony orchestras and symphonic bands in the capital as well as in other states; the most active ones are in Kuala Lumpur, Penang, Perak, Selangor, Melaka, Johor Seremban, Pahanag in the peninsula and Sabah in Borneo. I hope to able to form a horn community here in the near future by organizing gatherings, workshops, ensembles, clinics, etc. and with the support of IHS. Sono Angelo Bonaccorso, professore di corno presso il Conservatorio di Catania e Terzo Corno presso il Teatro Massimo Vincenzo Bellini di Catania e collaboro regolarmente con le migliori orchestre del panorama italiano. In qualità di rappresentante dell'area IHS Italia con orgoglio posso dirvi che si stanno svolgendo parecchie manifestazioni che riguardano l'approfondimento dello studio del corno con ospiti internazionali, una di queste (in cui promuoverò l'iscrizione a tutti i ragazzi all'IHS) è la quarta edizione del Festival Cornistico Dell'Etna che quest'anno avrà come grandi ospiti Miklos Nagy, Zora Slokar, Nilo Caracristi, Guglielmo Pellarin e il direttore d'orchestra Antonino Manuli. In più per la prima volta ci sarà il primo Concorso Internazionale per corno con una giuria internazionale e premi fantastici offerti dai nostri partners Engelbert Schmid, Johnny Casalanguida e Magazzino Musicale Miceli. Il tutto con la supervisione della FEBASI (Federazione Bande Siciliane). Avremo conferenze, masterclass, esposizioni di corni e tanti concerti con solisti internazionali e tutti i partecipanti. Sarà una grande festa del corno che durerà 5 giorni dal 18 al 22 di Agosto 2019. Il tutto con lo spirito e la mentalità giusta che la IHS ha sempre insegnato a tutti noi. Amy Thakurdas is the country representative for the United Kingdom where she was previously on the committee for the British Horn Society. This year she has encouraged players to join the IHS and attend the symposium in Ghent, Belgium. An octet from Oxford Horns will be performing, and this will be the first symposium for all 8 new members. Amy also encouraged her friends in the Coldstream Guards who also joined the IHS and are performing at IHS 51 in Ghent. Royal Birmingham Conservatoire (one of the UK's most prestigious schools of music) is hosting a masterclass for Sarah Willis on 19th & 20th June at their conservatoire. The Coldstream Guards will be performing the Beethoven Sextet on natural horns on 25th April. Their annual 'Horns at the Movies 2' concert is 26th June. On 29th June they’ll be performing the Schumann Konzertstück. All concerts are at Guards Chapel, London. Amy Thakurdas, N.D. is the musical director of Oxford Horn choir, which has ensemble playing opportunities for local players. 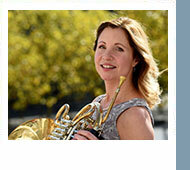 Amy has played the horn for decades in London and Oxford orchestras, as well as in Los Angeles. In 2020 she will complete her two-year series of solo concerts titled Romance your Soul. 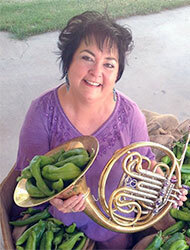 Amy heads the editorial section of the Music, Health and Science column in The Horn Call. Hello fellow horn players and IHS members! I have been the editor of the IHS Online Music Sales since its creation nine years ago. The Online Music Sales (or OMS) grew out of the IHS Manuscript Press, which was set up long ago as a mail-order sales outlet for prizewinners of the IHS Composition Contest. In 2009, internet e-commerce was taking off, and the Advisory Council wisely decided to get on board by widening the scope of the Manuscript Press. In the beginning, it only offered submissions of composition contest prizewinners, then expanded to include anyone wishing to make their horn-focused compositions available for purchase as PDF downloads. In 2010 the Online Music Sales was launched. It has been gratifying to watch the catalog triple in size since that time. At this point the number of pieces offered for sale is around 130 and is still growing steadily. We add new pieces every month. The catalog is carefully curated; every piece goes through a review process. The original team included Jeff Snedeker, Dan Phillips, and myself. Recently we added two more members, James Boldin and Gina Gillie, to the committee. Together we look at every submission, discuss its merits, and decide on a selling price. One of the aims of the OMS is to make the music we sell accessible and affordable worldwide. We especially keep affordability in mind when pricing the music. As a result, our prices are lower than most other online music sellers. At the same time the IHS wants to encourage and reward composers for making their works available, so it pays them a 25% royalty (this is generous in comparison to the industry standard of 10% or less). Recently the OMS has undertaken two large-scale projects to collect and sell works by Douglas Hill and John J. Graas. 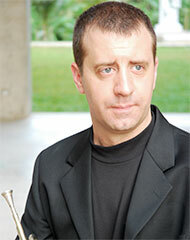 Doug Hill is, of course, a well-known pedagogue and is also one of the most prolific modern composers for the horn. The Hill Collection was initiated three years ago and now includes about 35 titles with many more on the way. Particularly noteworthy are his texts about warmups, high range, low range, and trills and tremolos. 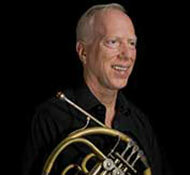 John J. Graas is one of the pioneers of horn in jazz, and Jeff Snedeker has undertaken the project of transcribing and re-engraving his music so it can be accessed by a wider audience. English version: "Why can professional players create such beautiful sounds?" If you are an IHS member and haven't yet voted in theis year's Advisory Council elections, please do so online now. Voting ends April 15 and results will be announced soon thereafter. Welcome to our new (and perhaps regular) feature, the Horn and More Trivia Quiz! This month, we have three copies of Richard Watkins’ fabulous new CD, The Romantic Horn (Signum Classics). Send your answers via email to hornandmore@hornsociety.org by April 30. If you guessed all three correctly, your name will be entered into the drawing. Good luck! All the questions this month revolve around another English virtuoso, the great Dennis Brain. 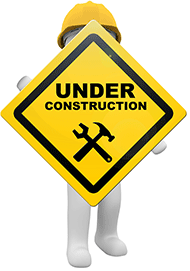 In the early days of the World Wide Web it was common to see “Under Construction” banners prominently displayed on many sites. In reality, every website is constantly under construction and IHS Online is no exception. Almost daily, updates are need to some aspect of the site. At the moment, we’re in the idea and planning stages of a facelift that’s likely to happen within the next few months. With a site this size and depth - as of this moment 1,361 content pages, 6,444 classified ads since we absorbed hornplayer.net in 2011, 472,473 visits to the excerpts section since we absorbed hornxcerpts.org in 2014, and 10,899 registered user accounts - that takes careful planning and execution to accomplish without disrupting normal operations. One of the important functions of the website is offering online voting for Advisory Council members - this year’s elections close on April 15, so if you are a member and haven’t yet voted either online or by mail, please visit your online polling station, log in to your account, and vote. In addition to the public facing content and services, the IHS website also provides officers, staff and Advisory Council members with record keeping, internal communication and voting, membership records and management, automated Friendship Project and club membership discounts, and a host of other services. In addition to keeping all of that running, I construct and send the bi-weekly Updates from the IHS newsletter that lists new classified ads, teacher database entries and section listings, and of course, this Horn and More newsletter.